Mazda has published details of two new limited edition models, the Mazda2 and MX-5 ‘Black Limited Editions.’ Only 500 MX-5s and 618 Mazda2s will be available in the UK. Inspired by the success of the MX-5 GT race car, which is competing in the 2011 Britcar Championship, the new models are distinguished by unique paintwork. 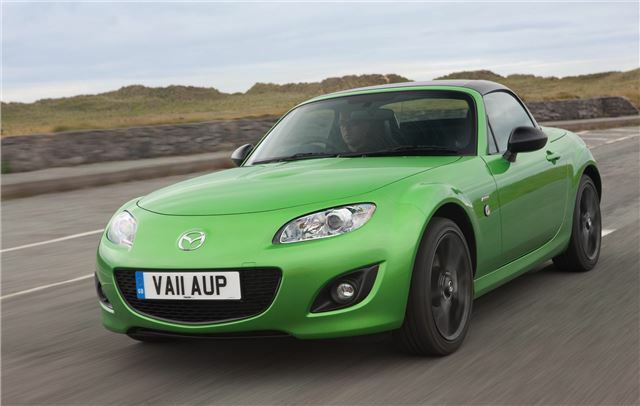 The MX-5 Sport Black features a black folding metal roof and is available in green, pearl white or red mica. It comes with 17-inch gunmetal alloy wheels, black leather, piano black trim details and ‘Black Limited Edition’ badging, as well as a numbered interior plaque. It features all of the equipment from the Sport Tech spec MX-5, including a premium sound system, climate control, Bluetooth, cruise control and fog lights. 500 will be made, priced at £22,995, £360 more than the model on which it is based. The Mazda2 has also been given the limited edition treatment, and is available in pearl white, metallic green and red as the MX-5 Sport Black. The Mazda2 Sport Black is based on the 1.3-litre Tamura model, and comes with a black vinyl roof, matt black alloy sheels, front foglights, privacy glass and a sports trim rear bumper. Internally there’s climate control, Bluetooth, electric windows and Black Edition badging, along with a numbered plaque. 618 will be made, starting at £12,395 for the True Red version and £12,815 for the other colours. “Special Edition models of the Mazda MX-5 have always been eagerly received by UK consumers, and the new Sport Black model takes inspiration from the MX-5 GT race car that embodies Mazda’s Defy Convention brand strategy,” comments Peter Allibon, Sales Director, Mazda Motors UK.